Complete the installation of your Napoleon gas fireplace with this flexible rear vent liner kit. 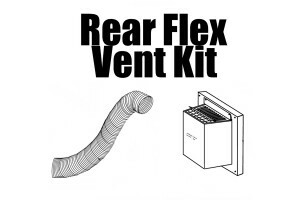 Designed for rear-vent Napoleon appliances that use 4" by 7" direct vent systems, this kit includes one 20" flexible vent pipe with a 4" inner and 7" outer liner and one GD222 wall terminal/vinyl siding shield. The kit is fully compatible with other Napoleon flexible vent components, providing a simple and quick installation in the home. You can complement your purchase of a Napoleon fireplace by including this venting system without the need for adaptors and extra parts. wil this kit work for a napoleon model no. gd36ntr? Yes, this kit is compatible with the Napoleon GD36NTR fireplace.